This unit of inquiry is not a recipe book but rather a launchpad to inspire new BIG IDEAS. We encourage you to use and/or modify one, or several of the BIG IDEAS below. Adapt it to the grade/ ability level of your students. The use of censorship inhibits freedom of expression. Why is it important to truthfully feel and express all feelings and ideas? Have we experienced and/or do we understand the scope and influence of censorship? Choose or devise practices to encourage students to be open to new experiences and ways of thinking in your classroom. For example, the MindUP in-school program. • Introduce the Theme: Present the Enduring Understanding and Guiding Questions using vocabulary that is appropriate for your grade level. • About Vancouver Biennale: Play a short video. • Create Project Space: Brainstorm ideas to make the project theme visual and visible using bulletin boards, and/or a project corner to share relevant materials and inquiry questions and processes. • Introduction to Sculpture and Public Art Unit Plan on information how art has evolved over time and the unique experience sculptures and/or public art brings. BIG IDEAS Anywhere educators: View the A-maze-ing Laughter Guided Tour Video MUTE ON and encourage students to explore at different angles individually and in groups. • This Art Inquiry process enables the students to practice observing, describing, interpreting, and sharing visual information and personal experiences. • Use the Art Inquiry Worksheet to guide and capture their ideas and impressions. Customize or create your own Art Inquiry Worksheet as appropriate for your project and class needs. Facilitate a discussion on how this installation is different from conventional self-portrait and to situations when one may elect to communicate with gestures. • Sharing Art Inquiry Experience: Ask students to share the Art Inquiry Worksheet responses in class. • View Guided Tour Video: View the A-maze-ing Laughter Guided Tour Video again with SOUND ON. • Artist Themes – Research: In small groups students rotate between information stations detailing the artist’s life and work. Station topics include: (1) education and training; (2) lifetime of artwork; (2) materials and processes; (3) beliefs and values. At each station, students answer questions and complete a task. For example, at the station “life’s work” students might plot the artist’s various installations on a map of the world. • Artist Themes – Freedom of Expression: Information may be deliberately imposed or tainted through media, economic, political, cultural, religious or other forces, and thus denies voice and understanding. This type of censorship is also a closure in listening, creating pre-formed ideas that block information being received and preventing a clear vision of what is. Viewing photo images of the artwork, ask students to revisit their initial reactions to A-Maze-ing Laughter and reflect on what the sculpture is expressing: is there something deeper behind the laughter? Facilitate a discussion relating to the guiding question: why is it important to truthfully feel and express all feelings and ideas? . Challenge students to talk freely amongst themselves without using the letter ‘S’ in any of their words. Teacher can provide students with a topic to encourage communication. Ask the students to move around and chat. Guide students to move in certain ways using varied loco-motor patterns, speeds and levels. For example, talk in ‘high, medium and low levels.’ Move quickly, move very slowly. Walk a different way such as backwards or sideways. Have the students move as if they were portraying an emotion such as anger or happiness. Challenge the students to incorporate feelings by moving one way and looking another. For example, move as if you were depressed but look as if you were surprised. Select a current event affecting our lives and province. For example, students can examine the Enbridge Pipeline proposal and perform research using online media articles and/or newspaper clippings. Students are to think critically and assess potential environmental risks vs. economic benefits and how their lives and future generations can be impacted by the decision. Students are to form small groups and present their findings. Teams can freely express themselves in any way they wish (dance, song, art, mime, etc.). They will have 20 minutes to complete the assignment and practice their presentation. Provide materials as required. Teams are to present their creative presentation to a panel. The panel can be made up of teachers and/or students. No critique will be given until after all teams have presented. After the presentation, the panel will enforce their own type of censorship by restricting expressions, colours, ideas, or words. Teams will modify their presentation accordingly to what is imposed by the panel and represent to the panel. 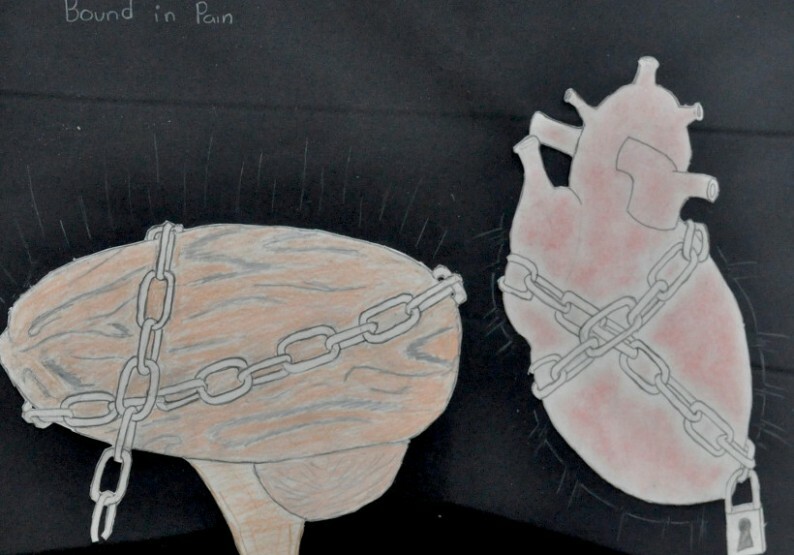 Debrief: Students are asked to share their experience when censorship was imposed on them and the importance of freedom of expression (feelings associated when this is blocked) and link this back to the art piece and Yue Minjin. The class can further research and explore how and where freedom of expression is suppressed intra/inter countries. Students and teachers decide on medium and methods to communicate their insights on how to find voice and mindfully express thoughts, ideas and feelings based on understanding of self and others. An option is the students can take the current event challenge and develop an expanded presentation to the school and community. Consider use of posters, websites, montages, written essays/poems, film and audio, dance, visual arts or theatre. Identify blockages to ‘student voice’ and develop essential supports to help break down these blockages to ‘student voice’ in school and community. Start with one’s own classroom and branch out. • Teacher and students can reflect on their entire learning process by revisiting the Enduring Understanding and relevant Guiding Questions. • How did the unit of study open inquiry, create cross–curricular learning opportunities and/or apply learning to real life situations? Has this unit of inquiry changed your opinions, values and world view? In what ways, if any, has it helped you grow as a learner? • Science – Ethical Behaviour and Cooperative Skills: From experiencing blockages and supports to mindful expression, view the documentary film Who Killed the Electric Car or any documentary films produced by Michael Moore. Identify and explore two major blockages to mindful expression and what support is needed to counter these blockages. Relate these findings to topics of ethics in Science.